Reed is a 2008 graduate of the Saint Mary-of-the-Woods College Woods Online program currently serving as SMWC’s executive director of marketing and communications. She was featured in the magazine as one of six 2018 Women in Business honorees. 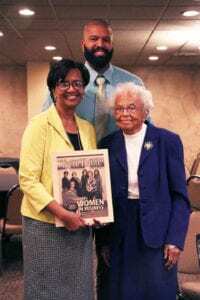 She accepted the award today in a ceremony at the Ohio Building in downtown Terre Haute sponsored by the Tribune-Star and Terre Haute Living Magazine. Originally from Chicago, Reed began her career as a graphic designer before eventually climbing the management ranks of publishing and healthcare. She later discovered her love for higher education when she joined Rose-Hulman Institute of Technology. After more than a decade at Rose-Hulman, Reed accepted the executive director position at SMWC and has been serving in the role for eight years. “The leadership team at SMWC, specifically Dottie King and Karen Dyer, welcome diverse thought, encourage risk taking, inspire confidence thus providing the perfect environment for me to further develop as a leader,” she told the magazine. Dee Reed with her son, Bryan, and her mother, Dorothy Ross at the Women in Business breakfast today in downtown Terre Haute. In addition to a bachelor’s degree in digital media communications from SMWC, she holds an associate’s degree from the American Academy of Art in Chicago and is a graduate of SMWC’s Wabash Valley Leadership Institute. She moved to Terre Haute in 1979. In her acceptance speech, Reed said she was honored to be counted among accomplished and outstanding women in the area. She emphasized the value of community. “We mentor each other, we inspire each other and we empower each other. Most importantly, we do those things so that others can follow in our footsteps,” she said. Reed serves on the boards of a variety of community organizations including The Haute Initiative and the Wabash Valley Community Foundation. She is president of the Lost Creek Grove board. At The Woods, Reed leads several committees including the President’s Diversity Council, the Aspire Higher Strategic Plan Marketing and Outreach Committee and the Branding Committee. She also acts as advisor to the Black Student Union. She enjoys mentoring students and supporting community initiatives. Reed identifies her mother, Dorothy Ross, as the woman who inspires her everyday. Other 2018 honorees were Lakshmi Reddy, judge of the Vigo County Superior Court, Lisa Johnson of the Terre Haute Economic Development Corp., Cindy Gordon of Thompson Thrift Development, Inc., Lea Anne Crooks of Ivy Tech Community College and Kristi Howe of the Vigo County Public Library. Crooks and Howe are both graduates of Wabash Valley Leadership Institute, a partnership between SMWC and the Terre Haute Chamber of Commerce.